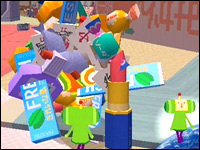 I was surprised and pleased to hear the critic John Powers on NPR’s “Fresh Air” today review… Katamari Damacy! I don’t think I’ve ever heard them review a game before, and he did it brilliantly. My only sadness came from the introduction, which was something like “Critic-at-large John Powers talks about a videogame he likes – and it’s not violent!” Sheesh. But be sure to give it a listen!